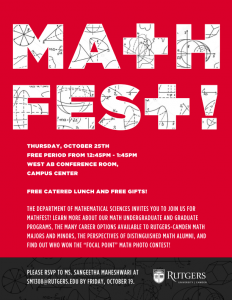 The Department of Mathematical Sciences invites you to join us for MathFest to be held at West AB Conference room in the Campus Center on Thursday, October 25th during free period from 12:45PM – 1:45PM. 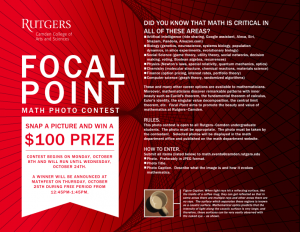 Learn more about our math undergraduate and graduate programs, the many career options available to Rutgers-Camden math majors and minors, the perspectives of distinguished math alumni, and find out who won the “Focal Point” Math Photo Contest! FREE catered lunch and FREE gifts. Please RSVP with Ms. Sangeetha Maheshwari at sm1308@rutgers.edu by Friday, October 19. Page last updated by Department of Mathematical Sciences at 2:49 pm November 29, 2018 . This page was printed from http://math.camden.rutgers.edu/seminars/events/ at 4:43 AM Tuesday, April 23, 2019.